This classically beautiful A. Jaffe semi mount with twinkling diamond halo and fitted diamond band offers the perfect amount of glitter to make your personally selected center stone truly stand out and shine. Fashioned in 18K white gold, this is the ideal wedding set for a woman who likes to keep it simple and sweet! Featuring a shimmering halo or 22 round brilliant diamonds, .11 TDW, this engagement ring is complete with an A. Jaffe signature fitted band of 21 round diamonds, .32 TDW, for an extra touch of sparkle! You can find this fabulous ring at Tara Fine Jewelry Company, home to a wide selection of A. Jaffe wedding rings and bridal jewelry. 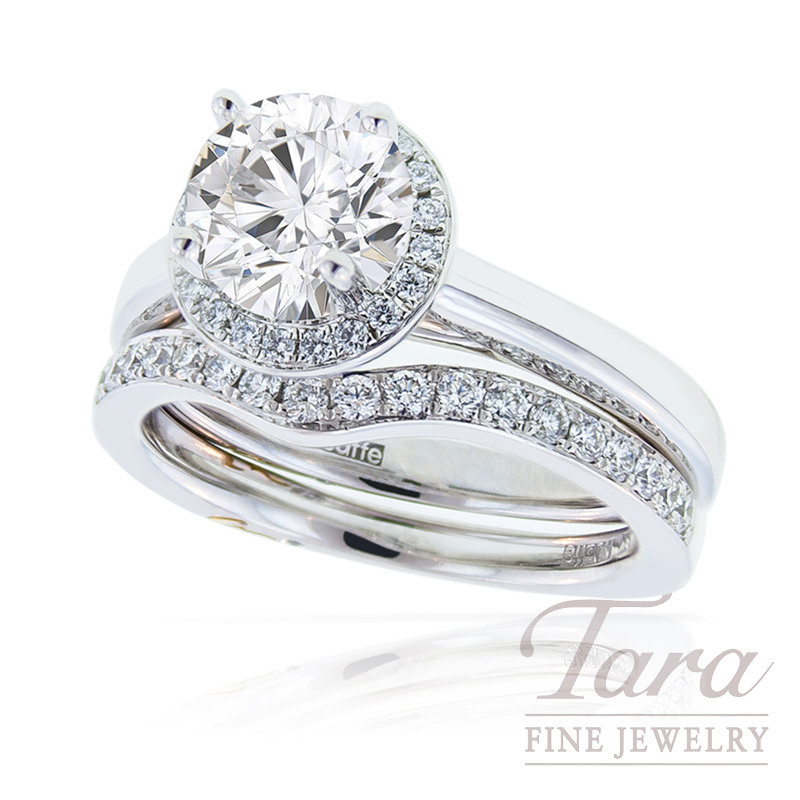 With over 28 years of business in the Atlanta area, Tara Fine Jewelry Company has the experience and expertise to guide you through your purchase of the perfect diamond ring. Skip the mall and come to the newly renovated showroom in Buford. Whether you are shopping for a luxury watch by Rolex, Tag Heuer or Omega, or eagerly searching for the ideal ring to "pop the question", Tara Fine Jewelry Company is here to offer you the finest jewelry selection matched with first-rate personalized service.